Lifestyles in Japan changed dramatically after World War II, when large numbers of people moved from the countryside to the cities to make their livings as office workers. As cities grew in both size and population, more and more people commuted from their apartments or houses in the suburbs to their workplaces in central areas. While a traditional Japanese household consists of three or more generations of the same family living under one roof, urban households today tend to consist of parents and children, with grandparents living elsewhere. Traditional Japanese homes are made of wood and supported by wooden pillars, but today's homes usually have Western-style rooms with wooden flooring and are often constructed with steel pillars. More and more families in urban areas, moreover, live in large, ferroconcrete apartment buildings. Two big differences from Western homes are that shoes are not worn inside the house and that at least one room tends to be designed in the Japanese style with a tatami floor. Shoes are taken off when entering a house to keep the floor clean. The genkan, or entrance, serves as a place for removing, storing, and putting on shoes. People tend to put on slippers for indoor use as soon as they have taken off their shoes. 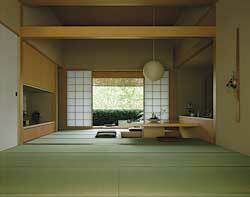 Tatami are mats made of a thick base of rushes and have been used in Japanese homes since about 600 years ago. A single tatami usually measures 1.91 by 0.95 meters, and room sizes are often measured in terms of the number of tatami mats. A tatami floor is cool in the summer and warm in the winter, and remains fresher than carpet during Japan's humid months. The word for "meal" in Japanese is gohan. This word actually refers to steamed rice, but rice is such an important food to the Japanese that gohan has come to mean all sorts of meals. A traditional Japanese meal consists of a serving of plain, white rice, along with a main dish (fish or meat), some kind of side dish (often cooked vegetables), soup (often miso soup), and pickled vegetables. In 2013, traditional Japanese cuisine “Washoku ” was inscribed on the UNESCO's Representative List of Intangible Cultural Heritage of Humanity as it represents the spirit of the Japanese people with their respect for nature. 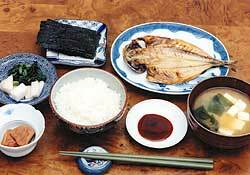 Japanese today eat many dishes from around the world, notably from Europe, North America, and Asia. In addition to rice, Japanese people eat bread, noodles, and pasta and enjoy a wide array of meats, fishes, vegetables, and fruits. 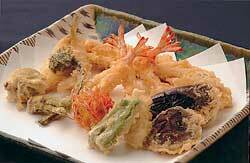 Sushi, tempura, sukiyaki, and other Japanese foods famous abroad are, of course, also popular in Japan. Cities, in particular, have many fast-food restaurants offering hamburgers and fried chicken, which are especially popular with young people and children. Before eating, Japanese people say "itadakimasu," a polite phrase meaning "I receive this food." This expresses thanks to whoever worked to prepare the meal. After eating, people again express their thanks by saying "gochiso sama deshita," which literally means It was quite a feast." 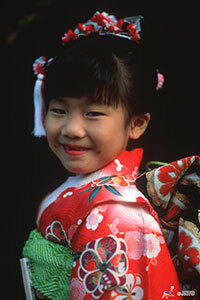 The traditional dress of Japan is the kimono. Kimonos, which are generally made of silk, have large sleeves and reach from the shoulders all the way down to the heels. They are tied with a wide belt called an obi. Kimonos are now usually worn only on special occasions, such as the Shichi-Go-San festival, weddings, and graduation ceremonies. Compared to Western dress, the kimono tends to limit one's movement, and it takes more time to put on properly. In the summer, however, a more easily worn, lightweight informal kimono known as a yukata is worn by children and young adults at festivals, fireworks displays, and other special occasions. In everyday life, though, young people tend to prefer clothing that is easier to move around in, like T-shirts, jeans, polo shirts, and sweat suits. Why do the Japanese take off their shoes when entering the house? How do people take a bath in Japan? What are the most popular dishes among Japanese children? When families dine out, where do they go and what do they eat? When do people wear kimonos, and how are they worn? What's a traditional Japanese room like?